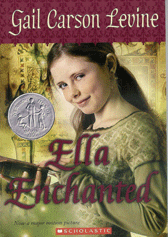 You may know that Ella Enchanted was my first published book after ten years of trying. I was starting a new writing class and needed an idea, so I thought maybe I could expand a fairy tale too. 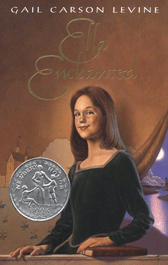 "Cinderella" is such an important tale, it's the first one I thought of. But when I considered it, I realized I didn't like Cinderella or understand her. She's so disgustingly good! And why does she take orders from her horrible stepmother and stepsisters? It's hard to write a book about a character who annoys and puzzles you. I was in trouble until I thought of the curse of obedience. Then I got it. Ella has to do as she's told, and she takes revenge whenever she can. While I was writing, the curse was an explanation and the problem that set the whole story going. I realized only later that I'd created a message for me. When I'm pressured to do something, I tend to knuckle under. Instead, I should be figuring out what's best and what I want. Then I should act on my assessment, even if people are disappointed or angry. I'm still working on it, many years after I wrote the book.